Defenders must learn how to "close-out" properly from the help-side position onto the player who has just received ball. The close-out should begin as soon as the ball is passed, while it's still in the air. On the pass, the defender should sprint toward the ball-handler in a low stance. The first few steps should be quick and explosive, while the last several steps should be quick, choppy steps to stop your momentum (so the defender doesn't dribble around you). Your baseline line foot should be back in order to force the ball-handler toward the baseline (we teach forcing to the baseline). As you approach the ball-handler, snap your shoulders and head back to help slow yourself down. We teach our defenders to close-out with the inside hand (closest to the midline) high, in order to contest the outside shot and the high pass to the post. And the outside hand (baseline side) is low, and in a position to "dig" at the ball, or deflect a bounce-pass into the low post. It's hard, but the goal is to contest the shot, while still being able to stop that first step of the dribble-drive. Too often I see a defender "flying" out at the shooter, feet in the air, out of control. This is bad because (1) he/she can easily be beaten with a shot-fake and dribble-drive, (2) he/she may foul the shooter (we never want to foul a 3-point shooter), and (3) if the shot is taken, he/she is in no position to box-out and rebound. So making good close-outs is a key to great defense. Some coaches teach closing-out with both hands high, but not everyone agrees (see "Are We Teaching Closeouts The Best Way?"). From DVD "Building the DeMatha Team Defense"
See the diagram below. Depending on the number of players on your team, make three or four lines along the baseline, and a same number of lines just above the free-throw line extended. Each player along the baseline has a ball and makes a good sharp pass out to the perimeter player. He then closes-out on the ball handler, yelling "Ball! Ball! Ball!". Use correct technique as described above. Then the receivers will similarly pass back to the next group stepping inbounds and make a close-out. You can also incorporate passing techniques (chest pass, bounce pass, etc) into this drill, and also make sure receivers are catching the ball with a jump-stop in triple threat position. This 2-on-2 drill features a defender in helpside, sprinting out of helpside and closing out on his/her man on the wing, on the skip pass. We teach the defender to close-out on the top, or inside, shoulder of the offensive player, with the outside foot back, in order to force baseline. In addition, our wing players must learn to play correct helpside defense (in the paint) when ball is two passes away on the opposite wing. See the diagrams below. Use two offensive and two defensive wing players. The ball is skipped passed back and forth while the defenders work on correct help-side positioning and closing-out. Rotate offense to defense after several passes back and forth. 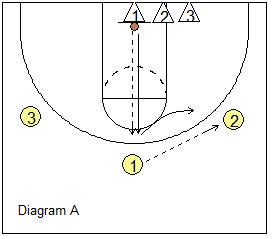 This is another 2-on-2 drill. See diagram A below. Start with a player in each corner and each wing. Player 1 in the right corner starts with the ball and passes to Player 2 at the right wing. As Player 2 skip-passes to Player 3 (left wing), Player 1 sprints and closes-out on Player 3. Player 3 catches the ball in triple-threat position, makes a shot-fake, and then passes to Player 4 (left corner). Player 2 sprints and closes-out on Player 4. From there, we play 2-on-2 (diagram B). Offense and defense rotate after each possession. Each possession is worth one point... awarded to offense on a score, or to defense on a stop. Play to a certain number like 7. Losers do push-ups. You can start with the ball in either corner. See the diagrams below. The coach C (or an assistant) starts with the ball on top (diagram A). There is only one defensive player X2, and he/she is in a defensive position on O2 (on the left wing). The coach skip-passes to player O3 in the corner. O3 passes into the post O4. 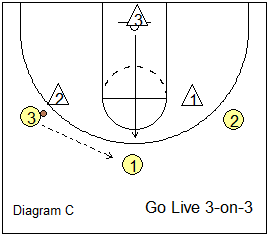 On the skip-pass (coach to O3), X2 sprints down to O4 and tips the pass from O3 to O4 out-of-bounds. O4 picks up another ball and quickly passes out to O1 on the right wing (diagram B), and O1 passes to the coach, who then passes to O2. X2 sprints back out and closes-out on O2. From there, O2 and X2 play 1-on-1 as O2 attempts to score (diagram C). The passes should be made quickly in order to make X2 really sprint and move. After each possession (or two), players rotate quickly (keep the drill moving). O2 becomes X2, X2 become O4, O4 goes to O3, O3 goes to O1, and O1 goes to O2. Here is a great, intense close-out drill that we got from Kim Barnes Arico, head women's coach at University of Michigan. The drill features three close-outs and then a live 3-on-3 drill. Diagram A below shows three offensive players, O1, O2 and O3 at the point and both wings. Three defenders start under the basket. The first defender X1 rolls the ball out to O1 and sprints out and closes-out on the ball. O1 then passes to O2, and for the purpose of this drill, X1 jumps to the ball and closes-out on O2. 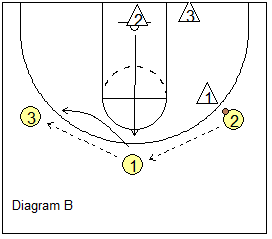 O2 passes back to O1 (diagram B) and the next defender (under the basket) X2 sprints out and closes-out on the ball. O1 then passes to O3, and X2 jumps to the ball and closes-out on O3. O3 passes back to O1 (diagram C). The third defender X3 sprints out and closes-out on O1, and now we go live 3-on-3 until either a score or a defensive stop. To make it competitive, split your team into half white and half yellow (or whatever your colors are). Yellow team starts on offense, white on defense. Substitute players with each possession so they all get in. All defensive players are along the baseline and all offensive players come in from the top. Keep score for each possession. Each team gets five - seven possessions (depending on how much time you have), and then we switch offense and defense... white is now on offense, yellow team on defense. Losers either run or do pushups. Are We Teaching Closeouts The Best Way?